The deep terracotta brick floors here help this updated, modern farmhouse retain its old world charm. 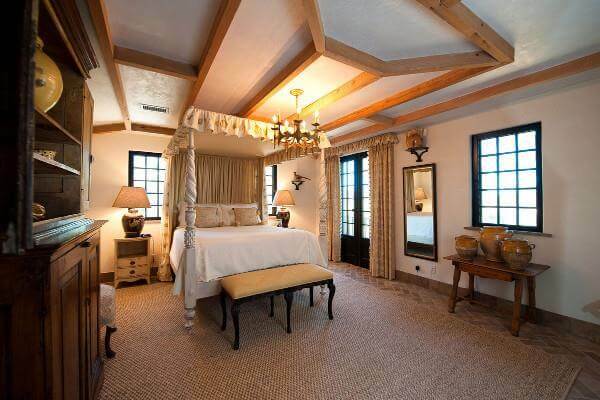 Welcome to another Home Flooring Pros buying guide. This week we look at brick flooring, both brick tile flooring and brick paver flooring (and even brick look tile flooring!). As well as looking at the different types of interior brick flooring we’ll also cover the benefits and drawbacks of brick, average prices and where to buy, installation and cleaning and finally some design and pattern ideas. There’s quite a lot to get through so feel free to use our quick links if you want to skip to a certain section. It’s a fact: fired clay bricks are one of the most durable and strongest construction materials known to man – they have been used around the globe throughout the millennia, with the oldest known examples dating back to 5000 BC! That’s incredible! Whilst bricks are most commonly used to build walls and exterior driveways, pavements or roads, in recent years using brick as an interior flooring option is seeing a resurgence in line with the growing popularity of décor styles such as Rustic Charm and Industrial Chic. 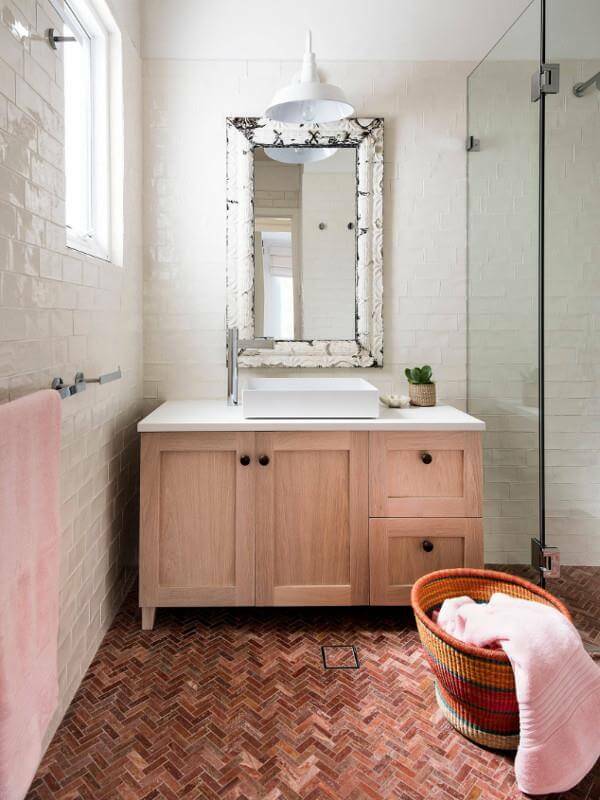 Brick floors have a very specific charm, with its terracotta tones and roughish surface adding texture and warmth to a country cozy room; at the same time brick floors – when combined with sleek modern fittings – brings an interesting, rugged counterpoint to contemporary settings. Read on to discover more about the pros and cons, the different options and costs involved in installing brick flooring. It’s important to note that there is a difference between the bricks you would use to build walls, and the ones you’ll likely use to finish an indoor brick floor. Whilst both kinds are made using the same materials of clay and shale – fired in a kiln at extremely high temperatures – the style of brick used for interiors is commonly referred to as brick paver or brick veneer flooring(and sometimes, rather confusingly as brick floor tile). Brick floor pavers are typically ¼ to ½ inch thick (compared to a standard masonry brick which is 2 ¼ inch thick); width and length will vary according to manufacturers. It usually makes sense to use brick pavers indoors, as being thinner makes for an easier transition to a different type of flooring if required. Also the most commonly used type of masonry brick – known as an extruded brick – have core holes running through to make them more economical to manufacture, bond more efficiently with mortar and cement render, and provide a certain amount of in-built insulation. Brick flooring pavers, on the other hand, are always completely solid with no air spaces. This makes them extremely tough and able to withstand very heavy loads. This is why brick pavers are also used for outside flooring such as patios and driveways, though usually for those exterior projects you’ll be using a thicker brick paver, more similar in dimensions to a masonry brick. 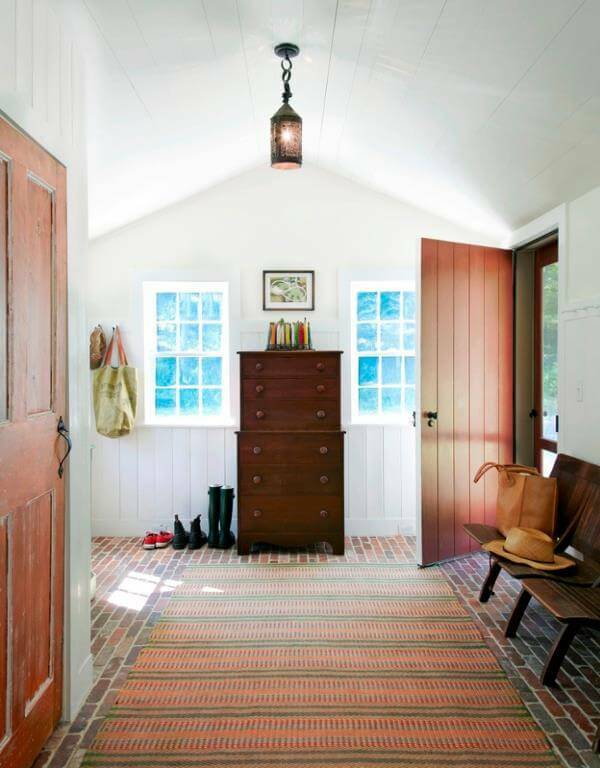 Rugged and durable brick floor pavers are the prefect choice for this an entry hall/ mudroom. It is also useful to know that there are a number alternative brick floor options, such as faux brick porcelain tile, which we will discuss in more detail later on in this article. Finally, it’s worth noting that, whilst brick flooring is made from clay and shale, no two bricks are ever completely the same – giving all brick flooring a slightly mottled coloring. Plus, indoor brick flooring is available in a number of different colors tones and styles. Natural clay powders can be added and different firing techniques are used to modulate the natural terracotta tone of clay – adding black, brown, gray, orange, yellow or white effects. Furthermore, the molds that are used to form the brick shape and the different finishing techniques before and after firing can dramatically alter the style and texture of the brick – from smooth brand new looking bricks, to much more rustic, antique looking bricks. As with all flooring, there are pros and cons of brick to take into consideration to be sure it’s the right choice for your home. The rustic aesthetic of brick flooring is a very distinct look for an interior space – it will give a period property extra authenticity and character; and in modern interiors it will add a rugged edge that works well with rustic, industrial and shabby chic décor. Brick paver flooring is available in a wide range of colors and finishes giving you enough choice to find just the right look for your space; textures from very rough to smooth are also available and, of course, there are several different layout patterns to choose from. Fired clay brick is one of the most durable construction materials known to man! 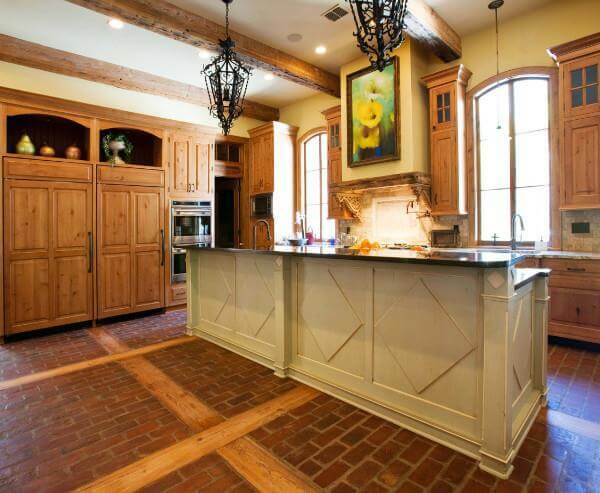 Your brick flooring will last for decades, possible even centuries! 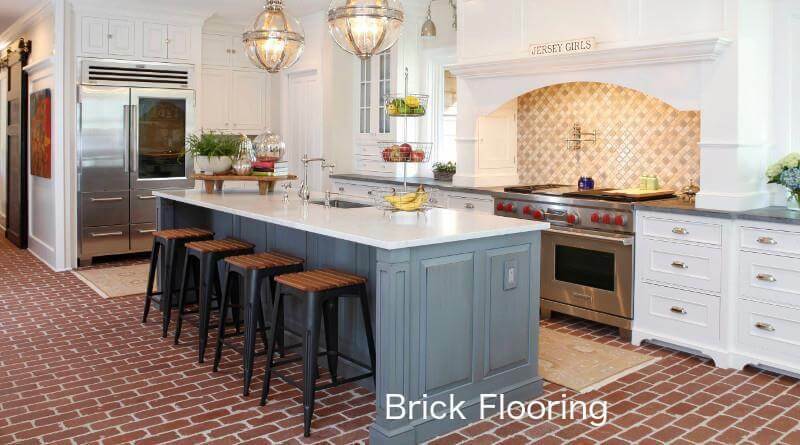 Fired clay brick can withstand extreme heat and is much more resistant to damage from fire than other flooring materials such as hardwood and carpet. The rougher texture of interior brick paver flooring makes it a lot less slippery than porcelain tiles. However, be ware if you decide they are too rough and opt for a wax finish, as that will minimize the anti-slip nature of brick. As we discuss later in this article, brick floor pavers are quite budget-friendly; however, if you are not an experienced DIYer then we recommend choosing a professional to install brick pavers, which will of course add to the overall cost. Clay and shale are naturally occurring materials that are available abundantly. Also, whilst it may take a lot of energy to fire the bricks, their extreme durability and longevity means that no extra energy is required to replace them in the long-run. Bricks can be recycled, and for a green option you can choose to go with reclaimed brick that has been cut into paver size. Due to its darker tone brick flooring is actually very good at hiding dirt, but it is also quite good at attracting dust due to its rougher texture. However, overall brick flooring is relatively easy to keep clean – with regular vacuuming and mopping. Do note, however, that brick flooring should be sealed to avoid stains form spills. Brick is inherently warmer than porcelain tile, and can be used with underfloor radiant heating to maximize its heat retaining properties. 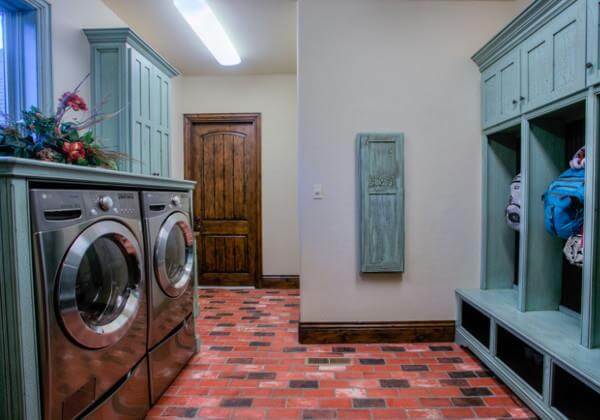 A full range of color tones are used in the brick flooring in this laundry/ mudroom. Brick flooring for an interior space can be incredibly beautiful, but it has a very strong character that is not to everyone’s taste. This flooring is not recommended if you are investing in a property for resale, or if your current home is not your forever home and you plan to sell it at some point. If you fall out of love with your brick flooring, replacing it could be a costly and messy business, as brick pavers will need to be smashed and ground to remove them from the subfloor. A potentially cheaper option would be to simply cover the brick with porcelain tile, but that isn’t always possible depending on your house or the project specs. Brick pavers are theoretically easy to install, but unless you have a very smooth subfloor, brick can show up uneven surfaces. This risk can be minimized by making sure your subfloor is immaculate before installing brick pavers. Brick pavers are quite heavy in comparison to ceramic tile, so they may not be suitable for your subfloor, particularly on upper floor levels. Brick is a very solid surface which some people find too hard underfoot, also you may find the texture uncomfortable if you’re not wearing shoes. There have been concerns that some of the adhesives used to install brick flooring could release harmful toxins. However, there are now many more environmentally-friendly glues/ mortars and grouts available on the market, so you can make a good choice. 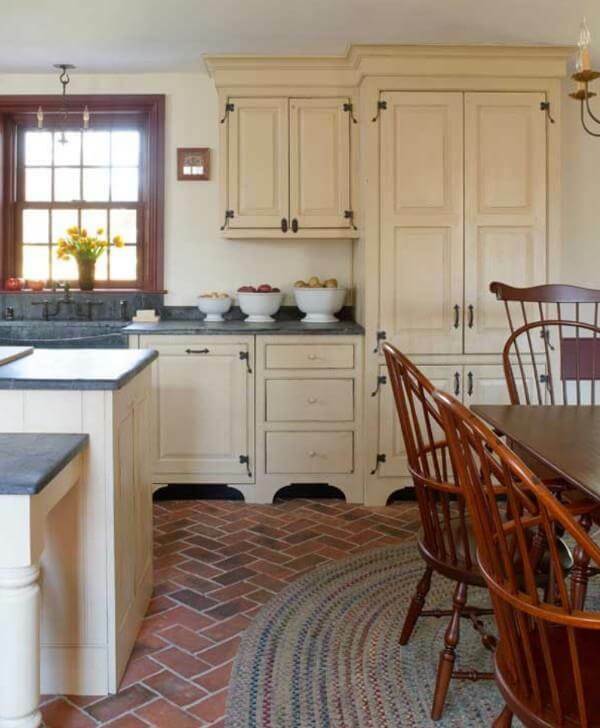 Laying brick pavers in a herringbone formation adds another layer of pattern in this traditional, farmhouse kitchen. Because different suppliers and retailers use different terms to refer to indoor bricks, you may find that many of the larger home improvement stores use the term brick pavers exclusively for pavers that are more suited to outdoor use. Whilst these pavers could technically be used for interior spaces, you will likely find that they are too thick and heavy. However, if you ask for brick veneer flooring – and be sure to check that they are suitable for indoor use – you will probably find the style and size of brick paver you’re looking for. Many large stores will also likely have faux brick tile flooring or brick look porcelain tiles, which are a decent alternative but not the real deal. So be careful to do due diligence if you want an authentic clay fired paver. The better alternative for real brick pavers is to shop at specialist suppliers such as Seattle-based Real Thin Brick or Inglenook Tile, who make authentic brick pavers in range of colors and styles. Expect to pay between $5 – $10 per square foot, depending on the style of brick paver you go for. Note this does not include installation cost, or the additional costs of mortar, grout and sealant. As mentioned earlier, these days for interior use, you’ll most likely be opting for brick pavers, and installing them is fairly similar to installing ceramic tiles. The most important thing to note is that, because brick pavers are relatively small, it is imperative to start with a subfloor surface that is as level and as possible. This will minimize your brick floor ending up bumpy and uneven. After deciding on a layout pattern, use bonding mortar or adhesive (depending on the manufacturer) to glue the brick paver to the subfloor. The next step is to seal the pavers, and allow the sealant to fully cure, before grouting between the pavers. A further coating of sealant once the grout is cured is also recommended. The whole process can take up to three days to fully complete, depending on the size of the room you’re paving. Whilst laying brick pavers is an achievable DIY job, if you don’t feel your skills are up to it, then you can expect a professional to charge around $6 – $8 per square foot to install brick pavers (not including the cost of the pavers). 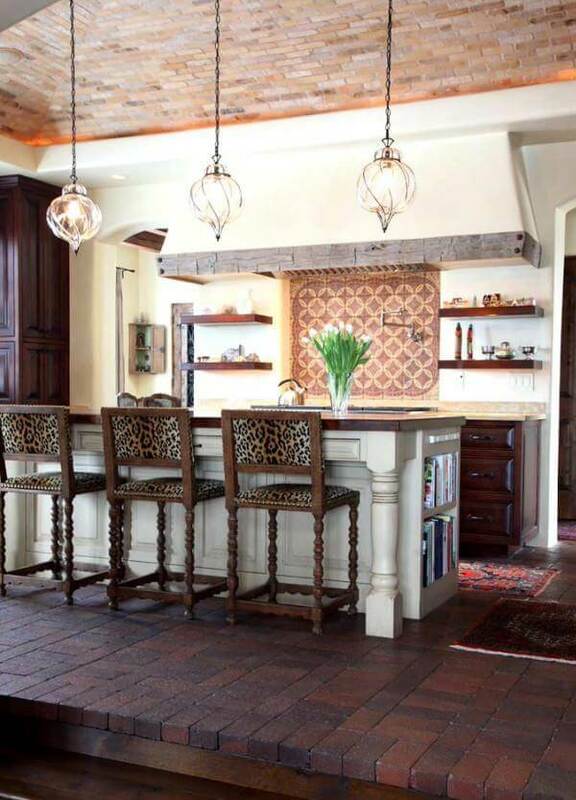 Dark brown terracotta brick flooring adds drama to this striking, rustic style kitchen. If you love the brick look, but aren’t sure if you want to have it permanently installed or are worried that real brick pavers might be too heavy for your subfloor, there are a number of alternative faux brick flooring options to consider. Just as there are wood look porcelain tiles, there are numerous brick look tiles that are designed to look and feel just like real brick pavers. Brick look porcelain floor tile is generally much thinner than brick pavers, and overall a lighter material, ideal for subfloors that can’t take too much weight. Just be sure that the porcelain brick tile you choose can be used for floors (and not just walls). It might seem a bit outdated, but sheet vinyl can be the perfect product if you’re on a very tight budget, or if you like to change a room’s décor quickly or often. You might have to really look hard for it, as it is not that common, but some manufacturers do make sheet vinyl with embossed brick designs. Crazy, but true, you can also get laminate flooring (which most of us probably consider as a hardwood alternative) that looks like brick. It’s often much cheaper than real brick pavers and, if you chose a decent brand, you’ll get a fairly realistic brick look with the underfoot warmth of laminate materials. We’ve already shown you some great examples of lovely interiors with beautiful brick flooring. Generally speaking, brick flooring tends to work best with rustic, country-style décor or against sleek contemporary fittings to add a bit of industrial edge. 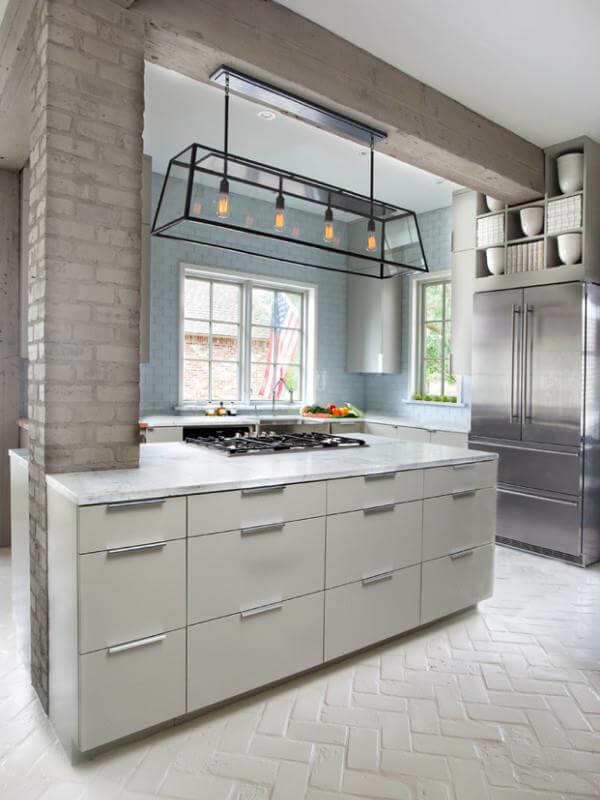 We also tend to see a brick floor used mostly in kitchens, mudrooms and entry hallways – areas that get a lot of heavy traffic where brick’s inherent durability is a huge bonus. However, brick flooring can be used in any room, so there’s no reason not to consider it for your bathroom, office space and even for your bedroom – it all depends on the overall look you want to achieve. 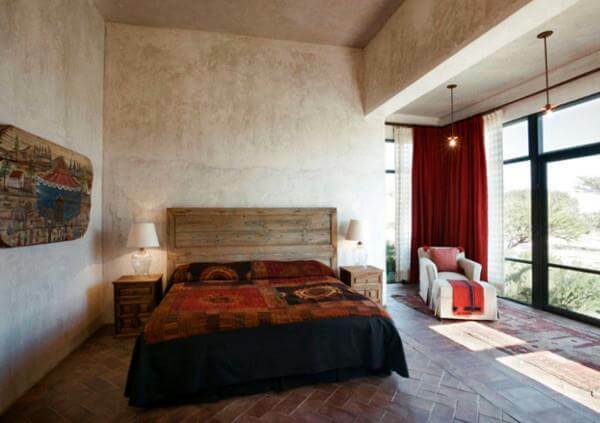 Brick flooring, against bare stucco walls gives rustic charm to this modernist home. Here the brick pavers are paired with classic, traditional farmhouse décor giving an authentic period feel. Delightful, almost mosaic-like, thin brick pavers add further texture to this shabby chic styled bathroom. 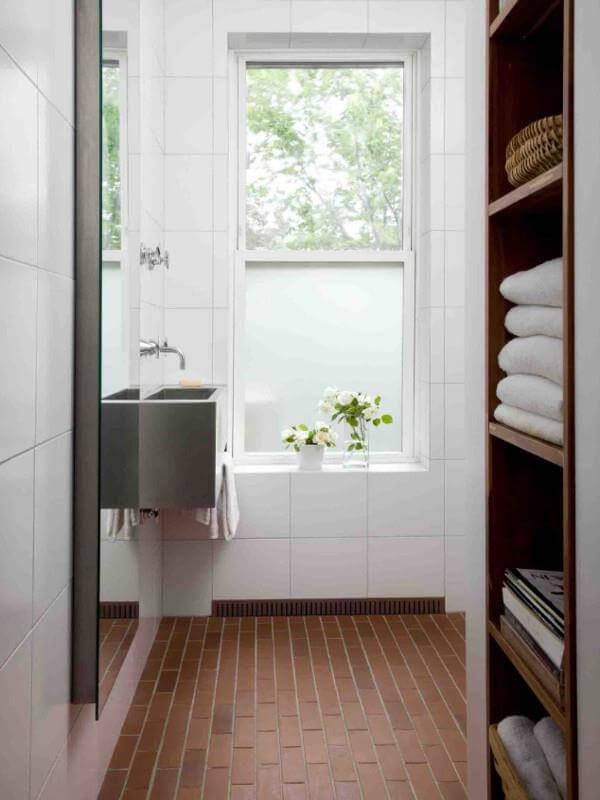 Slick and smooth, brand new brick pavers give depth and color to this contemporary shower room. Brick pavers with bold white grout applied in a haphazard fashion are a rugged counterpoint to this sleekly styled sunroom/ living room. 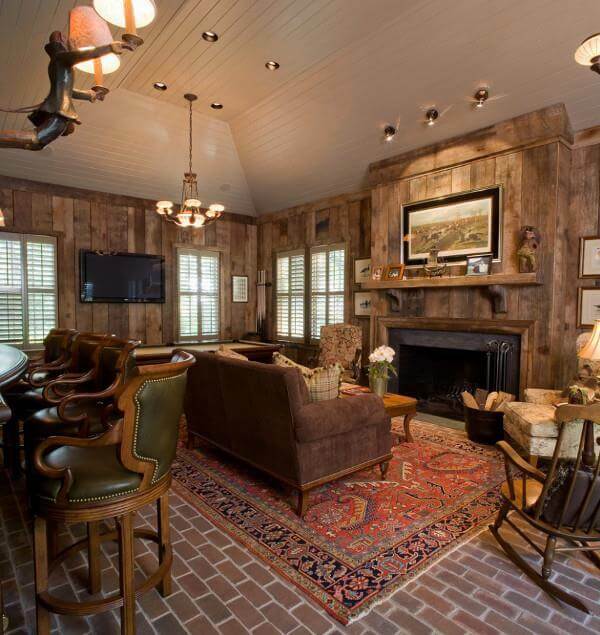 Warm, cozy and rustic – brick pavers enhance the cabin style décor of this family room. 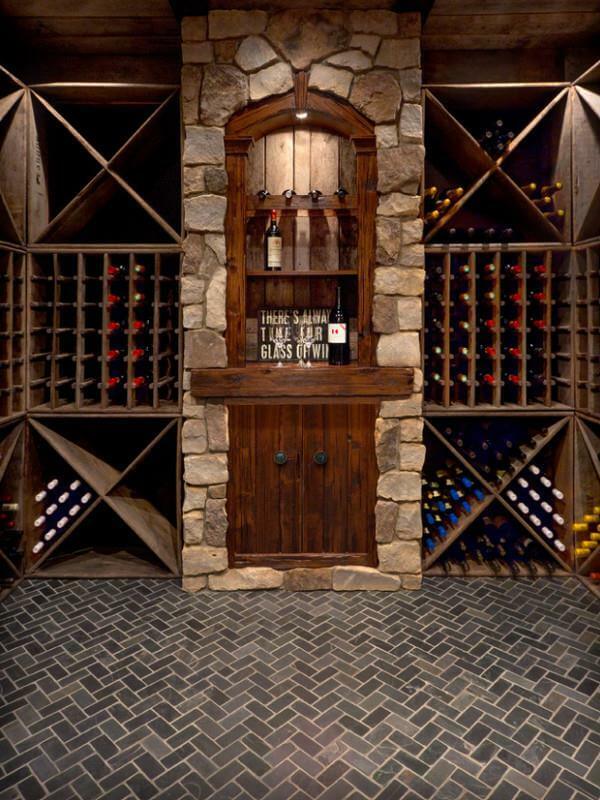 Brick flooring is a classic choice for a wine cellar as it helps keep the ambient temperature just right – plus it looks great! The rustic brick pavers here lend interest and texture to this otherwise plain home office. Using hardwood inlays alongside brick pavers adds further country charm to this farmhouse style kitchen. Here, painting the original brick flooring white and pairing it with slick modern fittings, exposed beams and whitewashed walls, keeps this industrial chic interior design light and airy. What is the best sealer to use if I want a more slick surface on top of my brick pavers?